Congratulations to Jacqui Bayliss on being the UK's top breeder for 2009! Jacqui Bayliss with Hurstfield Valaki Sword (1 CC) and his mother Can Ch Hurstfield Q-Truda. And congratulations to Can Ch Hurstfield Q-Truda on being the UK's top brood for 2009. At the CenTex shows in Texas November 22-23, 2008 Vastgota True Opal ("Olive"), owned by Mary Carter, won Best of Winners and her first AKC major! 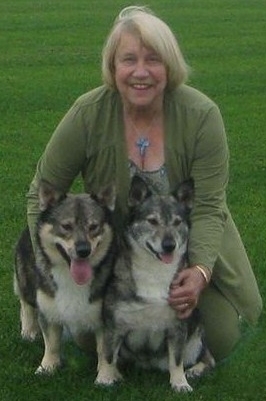 At the Swedish Vallhund Club of America's supported entry in West Springfield, Massachusetts, November 22, 2008, Vastgota Nina Ricci ("Nina"), owned by Amanda Lowery, won Best of Winners on the Saturday for her first AKC points!